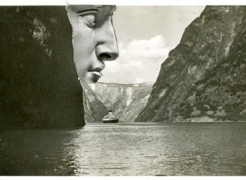 The Tibor de Nagy Gallery is pleased to present an exhibition of collages by the internationally acclaimed poet. 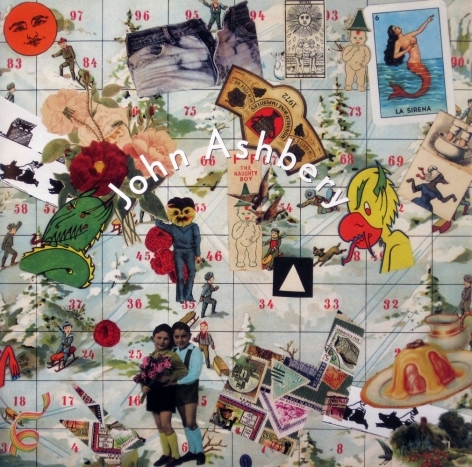 Although his collages have appeared in group exhibitions from time to time over the years, this exhibition marks the first solo exhibition devoted exclusively to Ashbery’s artistic output, which started as an undergraduate at Harvard and continues to this day. The exhibition also celebrates the poet’s long association with the gallery and marks the 55th anniversary of the publication of Ashbery’s first volume of poetry Turandot and Other Poems, which was published by the gallery’s Tibor de Nagy Editions in 1953. The earliest works in the exhibition are two collages that Ashbery completed while still a student at Harvard in 1948. Included in the exhibition is a series of collages from the 1970s that where done on postcards. He started using postcards during summer visits to Joe Brainard and Kenward Elmslie’s house in Vermont. The exhibition includes several large collages that were completed this year, and incorporate collage material that was sent to him by Brainard in the final years of his life. Many of these new works are inspired by board games that Ashbery has collected over the years. Ashbery was influenced at a young age by the collage novels of Max Ernst and the partly collaged Cubist paintings of Picasso and Braque. In 1958 Ashbery started to incorporate collage elements into his poetry. A recent poem, which is published in the exhibition catalogue, is an example of this creative process, in this case, of movie titles. Later his influences included Kurt Schwitters, Joseph Cornell, and more directly, Brainard. Why did I do this? More important, why did great artistic minds like Picasso, Gris, and Braque suddenly feel the urge to incorporate bits of everyday ephemera like newspaper clippings into their highminded classical work? Well, perhaps to bring it down to earth a little and make it more realist, in a certain sense. But no doubt also to introduce life, which is a mixed-media affair, into their paintings. As one studies them, one’s attention keeps shifting from the ebb and flow of angular or rounded forms to the printed texts in the newspapers, announcing perhaps a furniture sale or a crime that was the talk of Paris for a week. We’re all suckers for these appurtenances of daily life. Ashbery was born in Rochester, New York, in 1927. Best known as a poet, he has published more than twenty collections, most recently Notes from the Air: Selected Later Poems (Ecco 2007). His Self-Portraits in a Convex Mirror won the three major American prizes – the Pulitzer, the National Book Award, and the National Book Critics Circle Award. He served as executive editor of Art News and as the art critic for New York magazine and Newsweek. A member of the American Academy of Arts and Letters and the American Academy of Arts and Sciences, he was a chancellor of the Academy of American Poets from 1988 to 1999. The winner of many prizes and awards, both nationally and internationally, he received two Guggenheim Fellowships and was a MacArthur Fellow from 1985 through 1990.